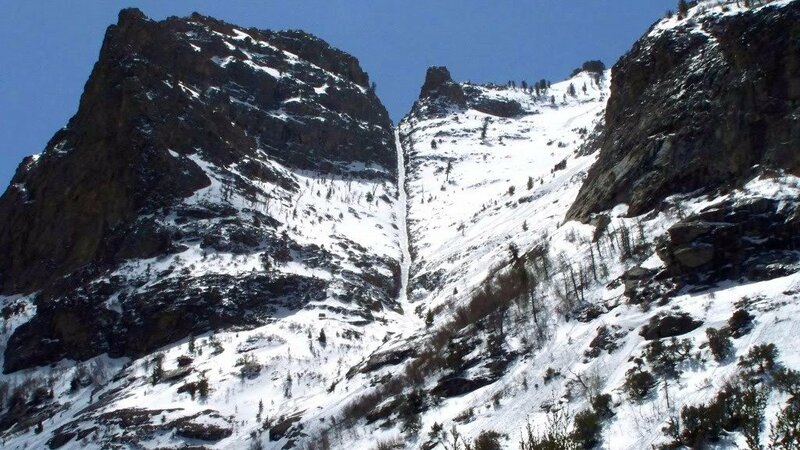 While driving from Utah to Tahoe on May 9th, my good friend Tilen Lane and I decided we should try and ski the uber-famous line known as Terminal Cancer, as it was only a 45 minute detour to the base of the route from the freeway. An interesting idea came up: "What if....we snowbladed Terminal Cancer?". Both of us are adept big mountain bladers so it seemed like the perfect idea! We quickly found our first obstacle of the day- a seemingly innocent river that turned out to be a lot swifter and colder than expected. After successfully crossing the river and some class III bushwhacking we found snow! We soon found quickly softening corn snow in the lower third of the run, but once the walls rose up everything turned to frozen icy death-chunder. Perfect conditions for snowblades! Important things in this photo: snowblades strapped to backs + innovative sunglass mounting position. A quick hour and a half hike later, and we were at the top! In an attempt to let some snow soften, we took our time at the summit by napping, snacking, and unsuccessfully trying to dry out socks/liners/boots. Quick stretch sesh and we're ready to rip!! The top half of the run turned out about as expected - terrifying sliding down really icy moguls on sub-par edges with about 100 cm of effective edge. As we reached the bottom where the sun had hit, the snow quickly turned to perfect corn which made for some fun bush jumping and soul turns. The river hadn't moved while we were gone...oh well.